Fondly known as “Mac,” McCormick Hall is a residence hall that houses students that are generally 18 years old and older prior to the start of the Fall term. 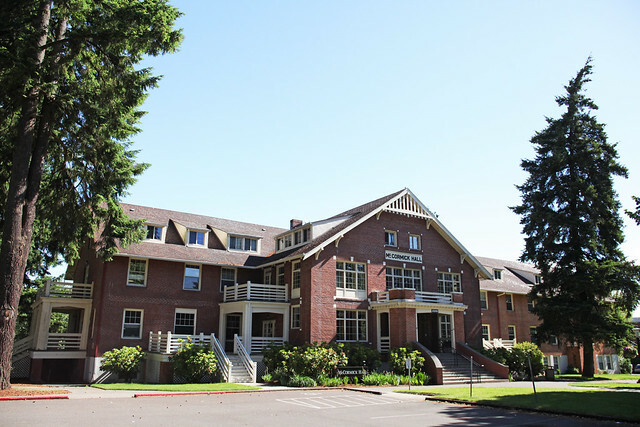 The residence hall offers single, double and quad rooms, along with social and study area, a community kitchen, and laundry facilities — and a storied history shared by Pacific University alumni. McCormick Hall, fondly known as "Mac" is a traditional co-ed residence hall and is home to over 125 residents. Mac has single, double, and quad rooms, with gender specific restrooms on the floors. There are also some single, double, and quad suites with shared bathrooms. This residence hall houses students that are generally 18 years old and older prior to the start of the Fall term. Keep in mind that room layouts vary in McCormick. Not to scale. Mac has an open balcony overlooking the giant main lounge where residents hang out, study, and participate in hall activities. Large lounge/meeting area on the lower level is the called "The Doghouse." Community kitchen with supplies available for checkout. Games, movies, pool equipment, and cleaning supplies available to check out. Keyless entry in building with Boxer Card. Ethernet connection to the University’s Local Area Network (LAN) for each room occupant. Residents can connect to the Internet using the LAN or wireless connections. Mac Hall also elects a Hall Council at the beginning of the Fall term that acts as the voice of the hall in examining policy and sets money aside for programming, games, movies, and equipment available for residents to check out.